After a blustery Saturday Delmar Market, The Cheese Travelers headed to Saratoga for the Wine & Food and Fall Ferrari Festival at SPAC. Just as we arrived at the gate, a late summer storm was setting in. Dark gray clouds loomed toward us. Many of the vendors from the Grand Tasting Event were packing up before the impending downpour. A gray-suited gentleman begged us to leave, his finger pointed ominously toward the cloud mass in the distance. Winds began whipping the leaves. People in their finery dashed across the lawn in various directions; barefoot women toted their shoes in hand. The hot red Ferraris that lined the manicured lawn were disappearing one by one. As this chaos unfolded on the lawn, we ducked into the second tent to find Forever Cheese. It was nice to reconnect with our friends after the American Cheese Society Conference last month. We sampled some lovely cheeses: a star amongst them was Forever’s new Paski Sir, a Croatian sheep’s milk cheese with a buttery straw-colored paste and natural rind. The Pizzuta Sicilian Almonds were a delightful accompaniment, as was the Mitica Perata (Pear) Jam, a delicate paste with light, fresh, chunks of pear. The rains abated in the evening, and left an intimate group for the after-party. “Italian” tacos, grilled chicken, and garlic spinach catered by Brian Molino, Executive Chef of Prime business dining, complemented some lovely Chiantis, notably the 2007 Terre de’ pari, an elegant, silky texture balanced by earthy, complex, full-bodied fruit notes and a smooth, light tannic finish. Surprisingly complex for an organic wine. Sunday morning emerged from the storm as a beautiful sunny day. We packed up the three young cheesemongers for the Washington County Cheese Tour, our mission to visit the farms to see the animals and cheesemaking facilities. Everyone was excited about learning more about the farms whose cheeses we sell. Our first stop: Sweet Spring Farm. Nestled behind a pine woods on a lush rolling hillside overlooking the Argyle mountains, Sweet Spring is a small farmstead with 28 Nubian goats. Owner and cheesemaker Jeff prefers the Nubian breed to other breeds for their “higher butterfat content and rich smooth-tasting milk without the goaty flavor.” We have been longing to try his delicate bloomy rind goat cheese “White Lily” which has garnered some critical attention. 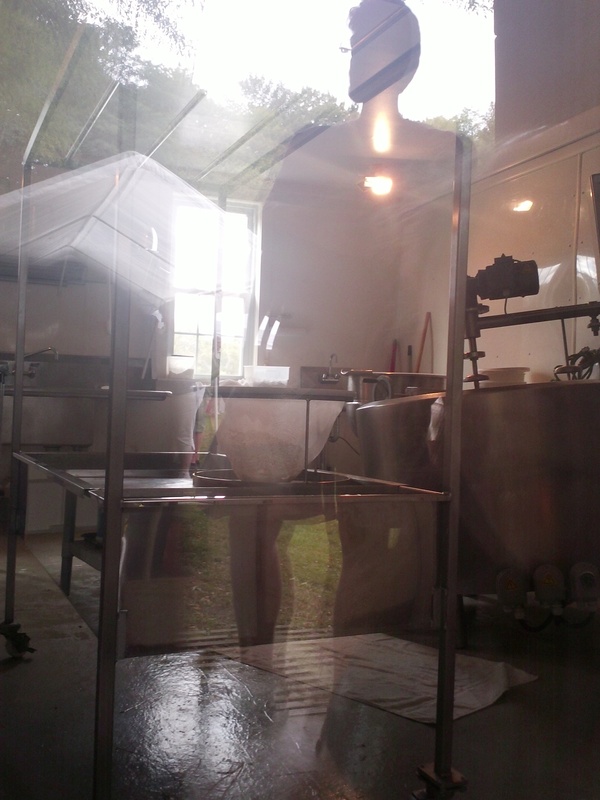 Jeff stood outside the double french doors gesturing to his cheesemaking facility on the other side of the glass. The steel surfaces were impeccably clean and fifteen young bloomy rind cheeses were just visible inside their aging refrigerators. His room was small, “cute” (according to Autumn, our young “cheesemongerette”) and beautifully organized. Jeff continued, “the goaty or ‘bucky’ flavor concentrates in the fat,” which then concentrates in the cheese and grows more intense as it ages. Shadow of Eric of The Cheese Traveler looking in at the Sweet Spring Cheese Room. What makes Jeff’s process so interesting to us is his scale of production: he milks the goats on the farm into milk cans and transports them by carriage up to the cheesemaking room. (This process is the origin of the cheese named “Carriage House.”) He then pasteurizes and processes the milk into cheese in a protected cheese room, and ripens the young cheeses upstairs and ages the natural rind cheeses in the cellar below. “White Lily” was as lovely as we expected — a dense textured paste with a clean, delicate flavor and low acidity on the palate. And we got a sneak peek of the ash-dusted, Valencay-style pyramid only available at the Saratoga Farmer’s Market. Sadly, “White Lily” had sold out by the time we got there, so we bought “Carriage House” instead, a hard, natural rind Gouda-style goat cheese aged a year and specifically for the annual Cheese Tour. Typically this cheese is made in a smaller format than the one we bought and aged half as long. We wondered what the cheese would have been like in a younger version, as this one tasted fairly sharp on the finish with a lingering acidity. And contrary to what we had heard, it had a pungent “goaty” finish. Of course, that didn’t matter to the hungry cheesemongers who ripped into the cheese to nosh with Terra Chips on the way to the next farm. Luckily, I saved a small piece for a special “Carriage House” Swiss Chard Soup the following evening. (Recipe to come). We piled into the cheese van in anticipation of our next stop: Consider Bardwell. We know the award-winning cheeses of this farm well, as we sell several of them at market. 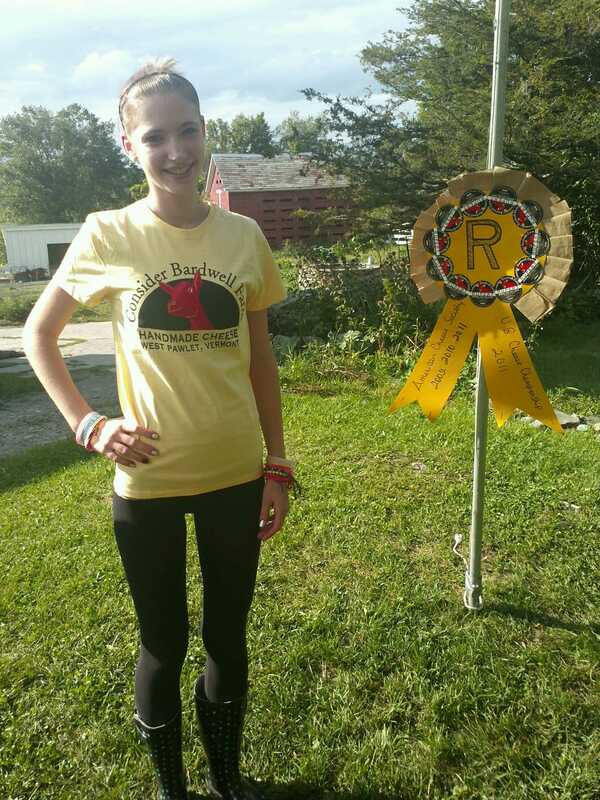 Consider Bardwell won two second place awards this year at The American Cheese Society 2012 for Manchester and Rupert and are highly decorated in their four-year history of the contest. 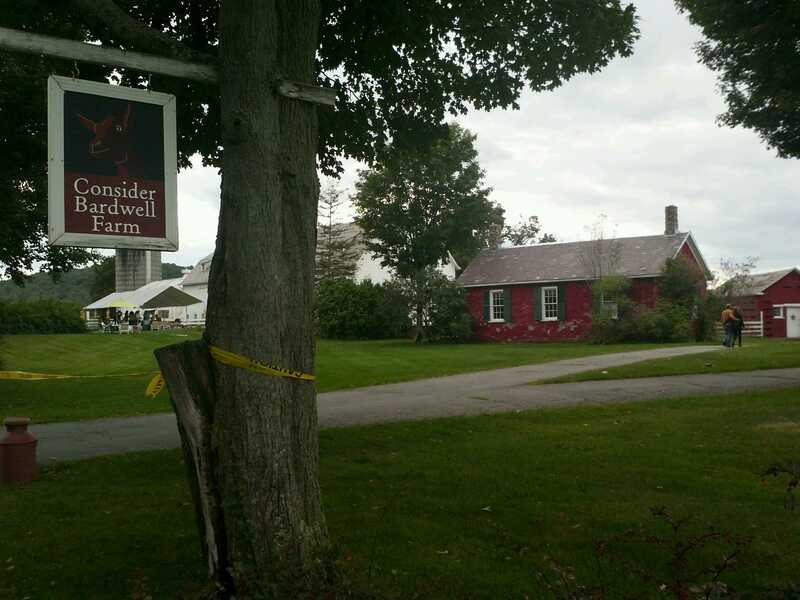 We crossed the New York border and wound around W. Pawlet Street through the town of West Pawlet. Instantly , we understood the derivation of Consider Bardwell’s cheese names, so different from the types of tradition from which they come. Names like Rupert (a cooked curd Comte/Gruyere-style), and Pawlet (washed rind Italian-style), and Dorset (washed rind French-style), Manchester, and Danby come from street names, town names, and the Rupert Town Forest surrounding the farm. This fact speaks to the vision of Consider Bardwell. 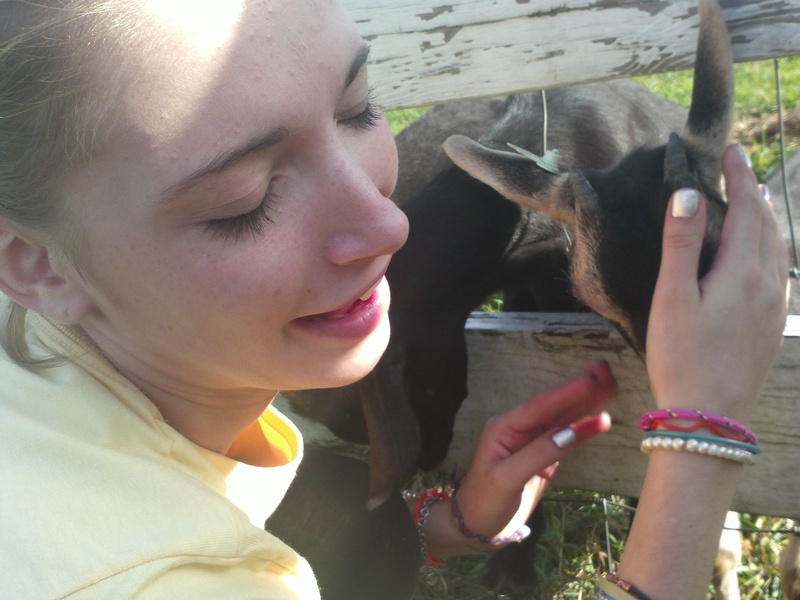 I kissed a goat and I liked it! The farm recently received a significant USDA grant to turn the pastureland around the farm, which had been the first dairy co-op in VT founded in the 19th century, back into perennial grasslands for organic grazing. Consider Bardwell raises and milks only goats, and a few heritage whey-fed Hereford pigs, but their cows’ milk comes from neighboring farms in Vermont and just across the border in New York State. Their vision is to create both farmstead and artisan cheeses, thereby bringing the dairy farms around them into cheese production and protecting the lands from pesticide use and restoring the agricultural history of the region. In our socks, we toured the two new cheese caves filled with our favorites and a few experiments, such as three wheels of the goat’s milk Equinox (styled after the sheep’s milk cheeses of Sardinia and soon to be renamed Danby) rubbed with sumac, giving the rind the deep red color of paprika. The farm has grown over the years, and each year, the owners add a new project. We spent our last moments on the farm sampling cheeses and some crispy cheese crackers made there. 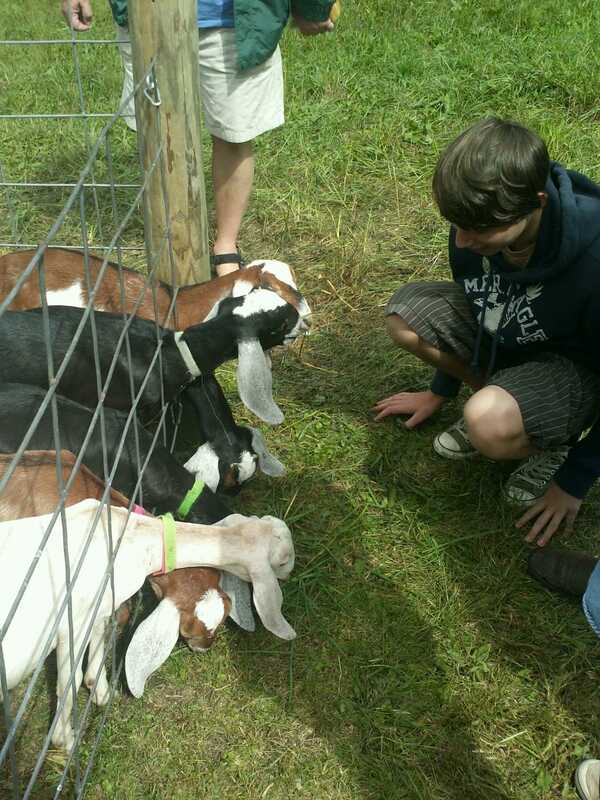 We bought some cool Consider Bardwell T-shirts and visited with the animals. 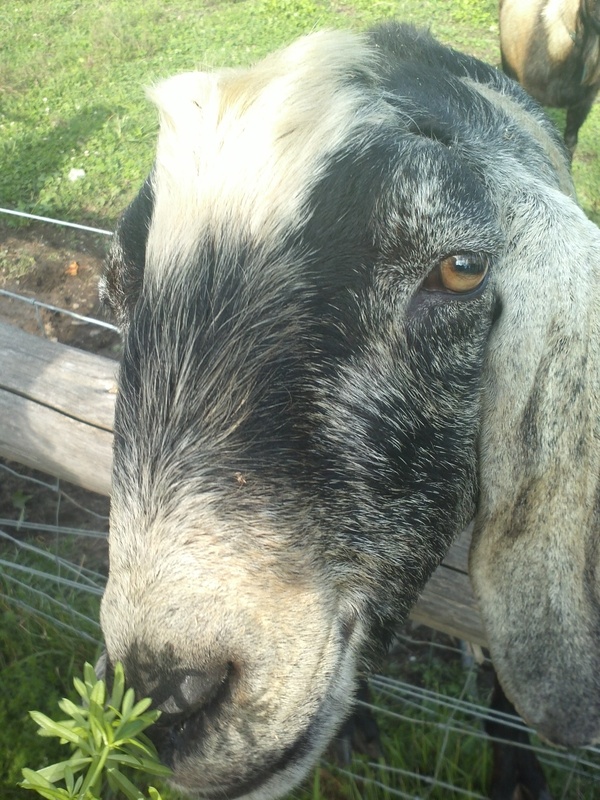 We fed the baby goats a mix of grasses, sweet woodruff, and clover–boy did they love the clover– and they were tame enough to let us pet their necks. Goats’ eyes never quite get represented correctly in pictures, because if they did it would probably scare folks away from them! Their pupils are black slits the run horizontally across the eye. Across the street the bucks are kept, because they would sour the milk if they were any closer to the dames. We tried feeding one of the males who seemed very interested in smelling us. He wouldn’t eat the grasses, but sniffed and sniffed until he blew out a massive sneeze on Eric and Alifair! What an end to our day. 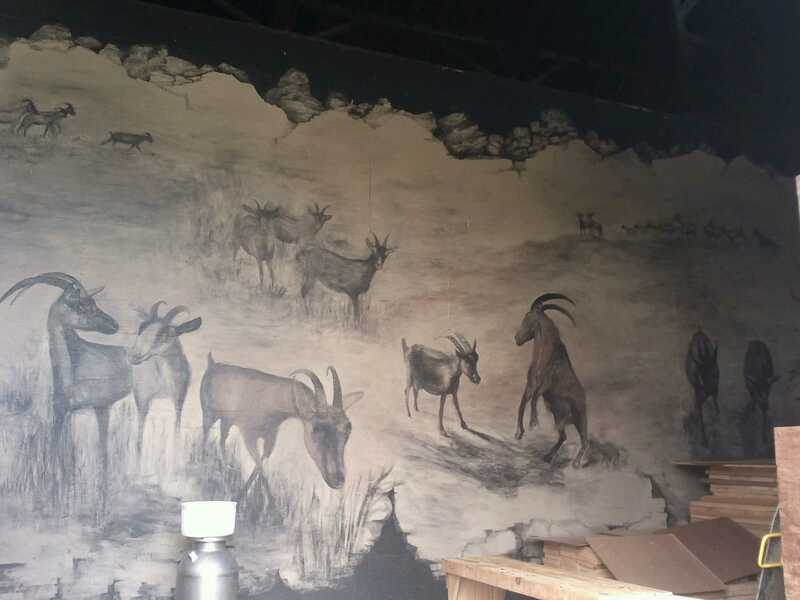 And while we did not visit 3-Corner Field Farm this year (we visited last year) you can read about them in The Masticating Monkey’s Two-Part article “The Washington County Cheese Tour” (Post 1) and (Post 2). You can also find their cheeses at our market stand. Come by soon! Don’t I look cute until I sneeze on you! 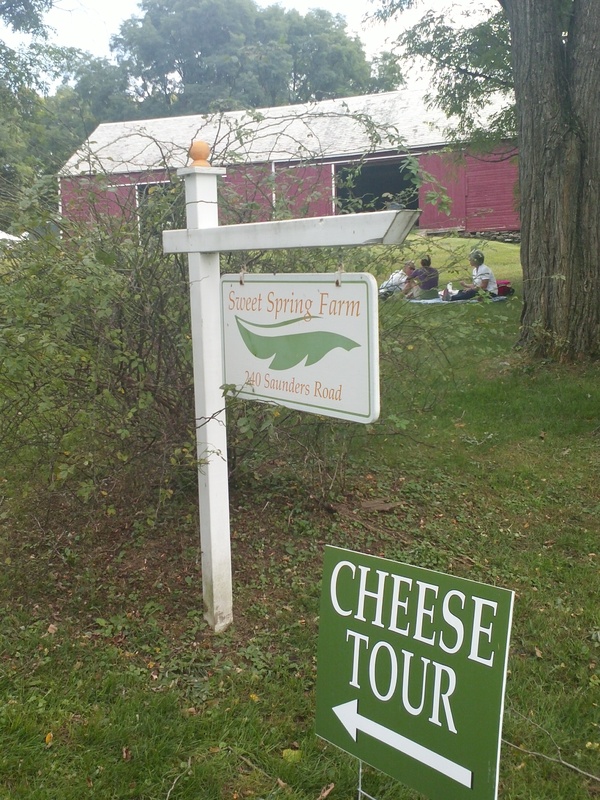 This entry was posted in Spotlight on Cheese and tagged cheese, cheesemaking, cheesemonger, chianti, Consider Bardwell, Daniel Berman, farm, Food and Wine and Ferrari Festival, Forever Cheese, Saratoga, Sweet Spring, Washington County by The Cheese Traveler. Bookmark the permalink. Great info! The Carriage House sounds great (they ran out on Saturday) and I only wish we’d gone down into those caves.